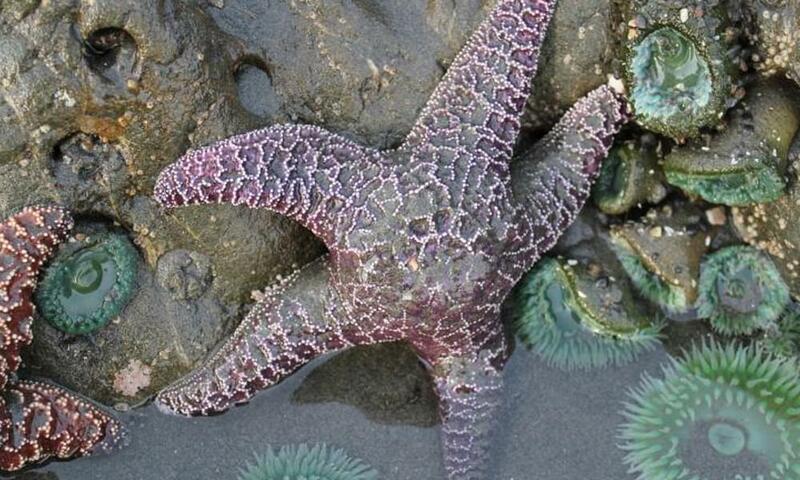 This journey features active immersion in a nature-lover’s utopia – Olympic National Park. Basing in two time-honored Northwest lodges – Lake Crescent Lodge and Kalaloch Lodge – you’ll find yourself waking each morning to some of the most exceptional smells, sights, and sounds. Kalaloch brings crashing waves, sea stacks, and rainforest, while Lake Crescent is more serene, with the turquoise waters and tree-covered mountains. Together, you’ll experience the peninsula’s range of habitats, from mossy forest to snow-covered ridgeline to rugged coast. This hiking focused trip takes us out on the trail for daily 4-8 mile hikes through subalpine forest, temperate forest, and along the rugged Pacific shore. Meet in Seattle, then head straight for the wild Pacific Ocean. En route, stop in the Quinault Valley for a taste of rainforest and lunch overlooking beautiful Lake Quinault. 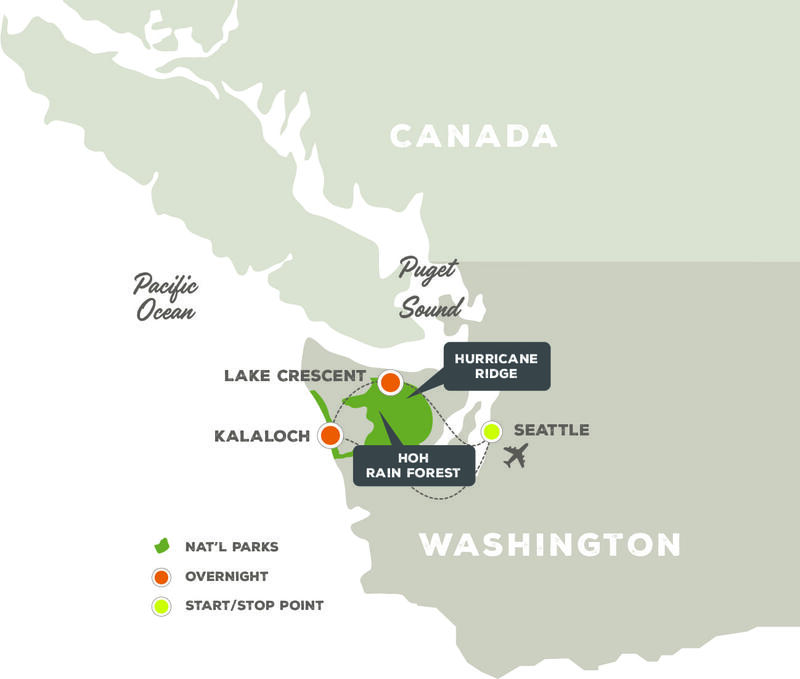 The day ends at Kalaloch Lodge, situated right on the water and our base for exploring the Hoh Rainforest. Next, we’re off to Lake Crescent, stopping to visit and hike along some of the rugged coastal beaches. From Lake Crescent Lodge, days on the trail are spent in Sol Duc Valley and at the top of Hurricane Ridge. This journey offers a memorable combination of days spent on the trail and evenings, dining and relaxing at classic national park lodges. Knowledgeable naturalist guides: Get the inside story on geology, wildlife, history, and past cultures from your top-notch guides. Walking and hiking: Your 4- to 8-mile daily hikes will bring true sole-satisfaction! Varied ecosystems: From the coast at La Push, to the Hoh Rainforest, to the alpine area of Hurricane Ridge, we'll explore all the landscapes Olympic National Park has to offer. This hiking-oriented trip takes place in elevations ranging from sea level to 5,242 feet, with 6-8 hours spent outside each day in potentially inclement weather. Hikes on this trip will be on trails and beaches, and range from 4 to 8 miles in length. Your guide meets you this morning near the Seattle airport then leads the way out of the city into the “real” Northwest. 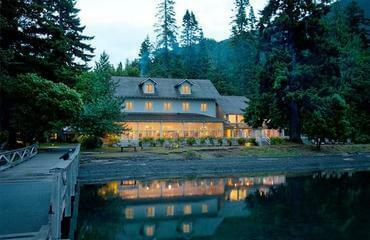 Enjoy lunch at Lake Quinault before an early afternoon hike in the Quinault Valley. Continue onto Kalaloch Lodge, a remote oceanfront hotel on a bluff. We’re out this morning to hike in the incredible Hoh Rain Forest. One of our walks will be the famous Hall of Mosses Trail, where old, big leaf maple and Sitka spruce trees are covered with epiphytic spike moss. One of the few remaining temperate rain forests on the continent, the Hoh features huge trees, cascading moss, Roosevelt Elk, and views of the Olympic Mountains. Drive north along the coast to the La Push area for hikes out to coastal beaches to view the Ocean Haystacks. Some options for the day are Third Beach, Taylor Point and a section of the Pacific Northwest Trail. Continue on to Lake Crescent Lodge to settle in for dinner, followed by a short hike to Marymere Falls. Take a full day to explore the Sol Duc Valley on a hike to majestic Deer Lake. The trail runs through old growth fir forest, past Sol Duc Falls, and up to the large subalpine lake. You’ll have earned your evening of relaxation at Lake Crescent Lodge, featuring a delicious meal and warm conversations. Full day to explore the Hurricane Ridge area. This afternoon, we’ll take to the high subalpine world of Hurricane Ridge. Hikes around Hurricane Ridge will depend on weather and trail conditions – expect beautiful mountain meadows and if the weather is clear, views of the strait of Juan de Fuca and Canada. After breakfast, we'll say good-bye and make our way back to Seattle for afternoon flights. We'll arrive at the airport before we're quite ready to really leave the Northwest—but in time to catch flights home after 2:00 pm. Kalaloch Lodge has been around since the 1930s, when Charles Becker, Sr. acquired forty acres of land from the lodge and to the south. The first cabins on the property were built with milled lumber that happened to wash up on the beach! The Beckers let the US Coast Guard use the buildings for their beach patrol station until after World War II, at which time the property became a seaside retreat once again. The main lodge was built at that time, and Kalaloch continued to be run by the Becker family until 1978, when the National Park Service purchased the property. 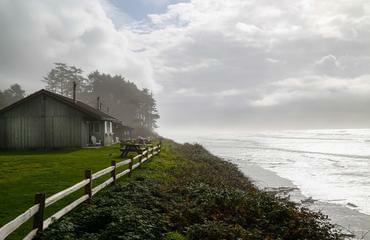 Kalaloch offers a classic, understated, oceanside lodge atmosphere. Historic Lake Crescent Lodge on Washington’s Olympic Peninsula is nestled among the giant fir and hemlock trees on beautiful Lake Crescent. Built in 1915, the charming resort features comfortable, spacious guest rooms. Enjoy the simple elegance of yesteryear as you unwind by the stone fireplace in the lobby or settle down in the cozy sun porch to catch a spectacular sunset over the lake.